The “International Buffet” is a concept that Chef has had brewing for some time, but has just now been able to assign a proper base shoe. With the launch of his custom Air Jordan 6 series of the same name, it made eminent sense for Chef to cook these foams up in a similar fashion. The series of listings after the jump will allow you browse the entire “International Buffet” launch. Don’t worry about the listing images being illustration / renders for now, as they are placeholders until these actual pieces are cooked into reality. You can read more about Chef’s method of listing work via illustration/render on the FAQ page. 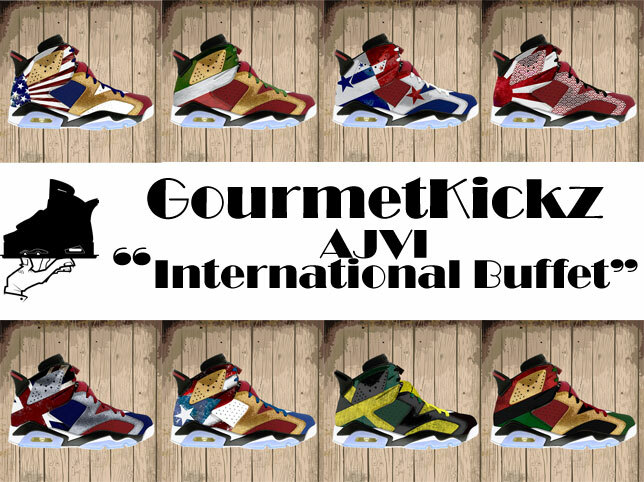 The customs you see here each represent a country or terrirtory or ethnicity and each have a “cousin” in a custom foamposite also listed on this site and shown after the jump. The countries currently available are: USA, Italy, Panama, Japan, UK, Puerto Rico, Jamaica, African American. The “International Buffet” is a concept that Chef has had brewing for some time, but has just now been able to assign a proper base shoe. With the abundance of Air Jordan 6 “Carmines” now on the market, all of the above customs have been mapped out on this very base shoe. The series of listings after the jump will allow you to send in your own “Carmine” for the customization of your choice. Anyone who grew up in the 80’s remembers “Laverne & Shirley” and therefore remember the charismatic and talented Italian American Broadway-bound balladeer “Carmine Raguso” aka “The Big Ragu”. That description alone, sans any knowledge of the a fore mentioned TV Sitcom should already paint a vivid picture of the inspiration behind these custom Jays. The image shown is of course an illustrated rendering of Chef’s vision. Bringing this shoe to life is as easy as firing up the oven for Chef, so cast no doubts on how the final cooked version will look. The gold panels will be gold leafing, and the remainder of the shoe will be painted with Angelus acrylics of course, and a custom box will be included. You need to provide your own Carmine Jordan 6, preferably deadstock, so feel free to place an order for this work after the jump. “Dear shark biters, while it is my pleasure to have been feeding you for over a decade, please do not view my return to sale-by-mockup as an opportunity to copy my concepts and ideas, as many of you have done in the past. 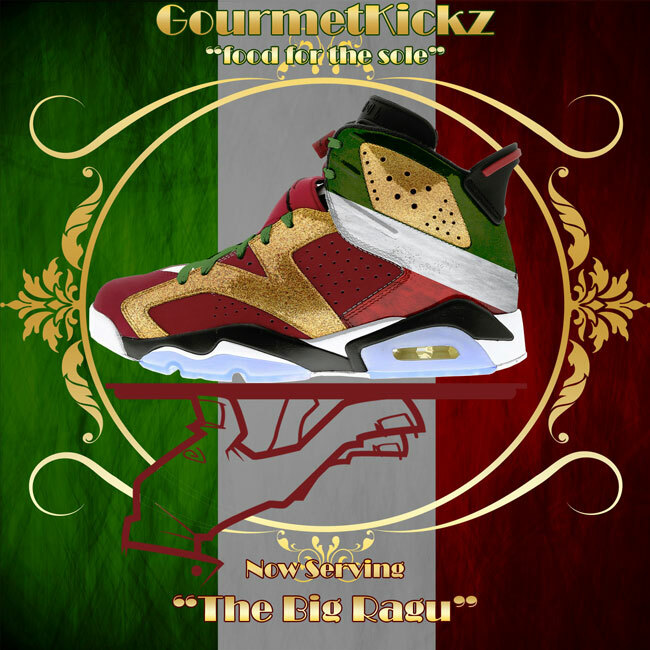 Futhermore I feel it is only fair to mention that the above render is in fact the Intellectual Property of GourmetKickz. Some of you copy cat mindless zombies have seen fit in the past to feed off the fruit of my brain by literally copying and pasting my images as your own, in an effort to use my illustrations as your selling tools. Well that type of use actually constitutes copyright infringement. The only authorized use of the above and below illustrations is for journalistic purposes or partnered promotion. Any other use of the above or below images are an infringement on my IP and shall be dealt with. So in short, keep your work original, don’t copy, give credit, and in doing so you will in fact be a true artist. One final thought, taking one of my concepts, no matter how old, and copying it so as to represent it as your own idea is still copying. Copying has no expiration date, so eat not of that fruit unless you wish to be forever tainted. Taking colorways from classic Nike’s and transplanting them onto other shoes is no new thing in custom sneakers, in fact that concept lies at the heart of the craft. As such is can get tiresome and repetitive. However, enter Chef of GourmetKickz who seems to consistently be able to transplant colorways in a manner that addresses the very DNA of both the donor shoe and receiving shoe. 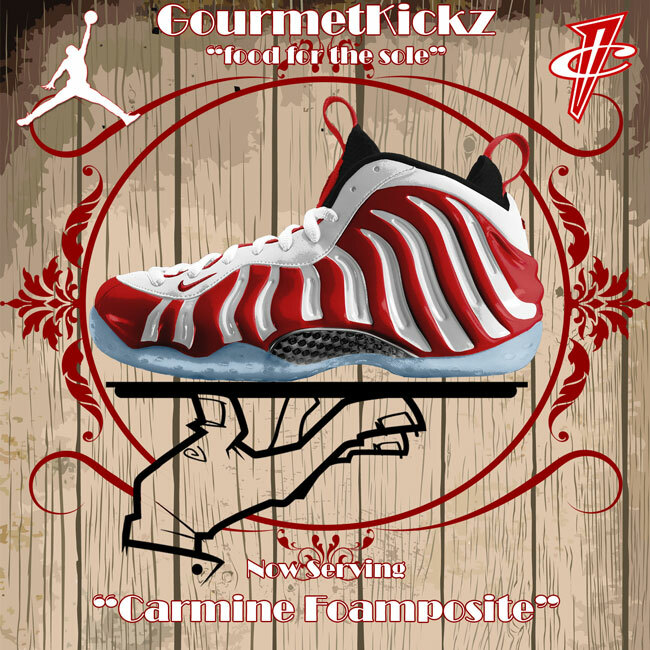 What you see here is the first step what will surely be a new movement from GourmetKickz in the way of custom foamposites. In fact Chef predicts this is “The Future of the Foamposite”. The above highly detailed render is a new addition to the arsenal of tools in the GourmetKickz Kitchen to assist in the GourmetKickz mass launch of “Penny +” releases. The + refers to the addition of other classic to the DNA of the Foamposite, a splicing of sorts. The concept here is simple, use a colorblocking method often overlooked to achieve a true color flip that complements the donor shoe rather than hides it. Penny Hardaway himself led the way in exposing this color-block method when he taped up the ridges of his royals in black to avoid NBA color violation fines. Since then Nike has never nodded to that accidental design genius, but Chef surely has… with the release of his “Freddy Foamposite”. In the above scenario the ridges are simply left white while the elevated areas of the upper are painted in Carmine red. Though the picture is a high quality render created by Chef himself, the shoes are available for order. The listing by mockup method is one that is necessary in this case if Chef hopes to beat the Shark Biters nipping at the meals of GourmetKickz to the punch in launching colorways that the above now gives light to. 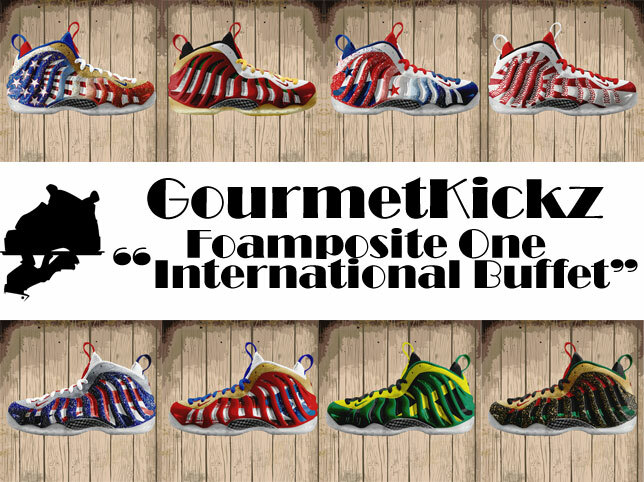 So in case the sharks are not out swimming and enjoying this Memorial Weekend, but rather sitting at the edge of Chef’s table waiting to feast on scraps, remember you saw this concept and step toward a new movment in Foamposites here first, from Chef of GourmetKickz. By the way, book your pair of these now after the jump!